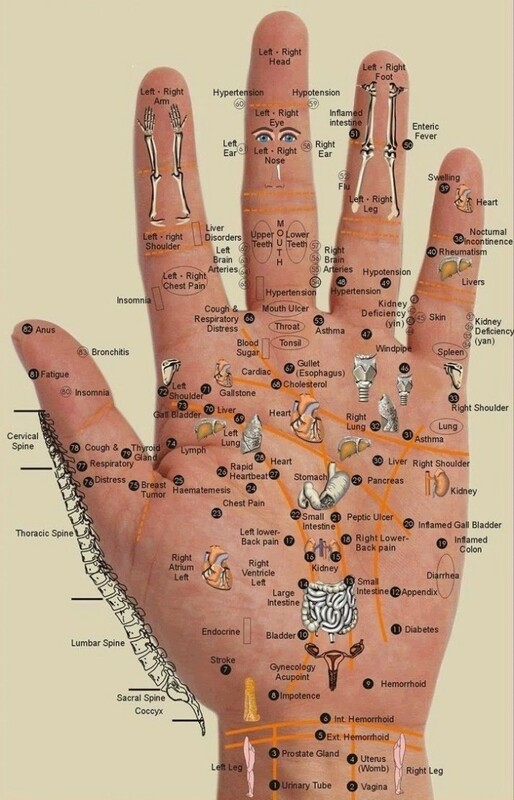 The principles of reflexology have led to the idea of finding the pressure points within the palm of your hand that are connected to the part of the body causing you pain. By pressing the thumb point into the corresponding part of the hand for 5 seconds, releasing for 3 seconds, pressing again and repeating this cycle for several minutes, several times a day you will get results. This methodology as well as others are demonstrated in this video. In the video you are about to watch, Dr. Oz's guest is a reflexologist who explains that both the hands and feet can be seen as a microcosm of our entire body. Five audience members come to the stage to explain what part of their body is causing them chronic discomfort or pain. For each malady, the reflexologist explains which part of the palm is connected to the body part involved. She then demonstrates how using one hand, different forms of pressing or massaging of a particular part of the palm of the other hand will, over time, alleviate the pain experienced. The audience members in this video suffered from: (1) Constipation and bloating (2) Insomnia and exhaustion (3) Sinus congestion (4) Upper back pain (5) Low libido. The reflexologist showed them how to work on their own palms to alleviate their pain or problem. She explained what sensations they would experience as they applied pressure and massage, that would signal that they were working in the correct area. Her explanations were fascinating and easy to follow. After watching this I will try a few of the methods demonstrated for things that I need relief from. Let us know what you think about reflexology after watching the video. Have you ever tried it and had success? Will you give it a try?.